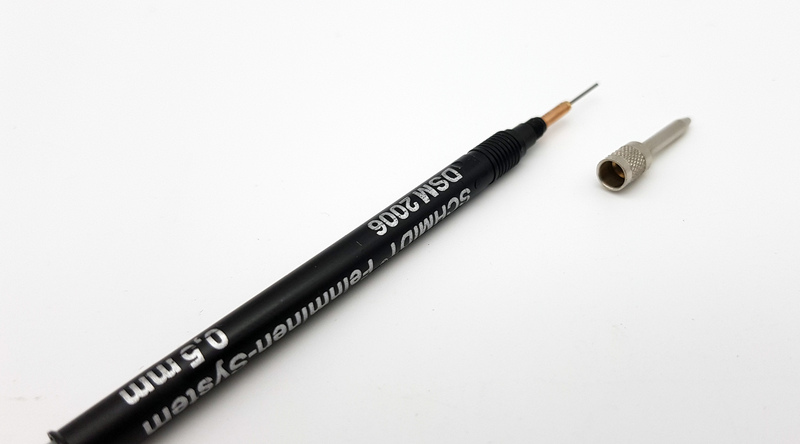 Review: Nitecore NTP40 "Titanium Alloy Mechanical Pencil "
Thread: Review: Nitecore NTP40 "Titanium Alloy Mechanical Pencil "
The Nitecore NTP40 was sent to me directly by Nitecore for review. 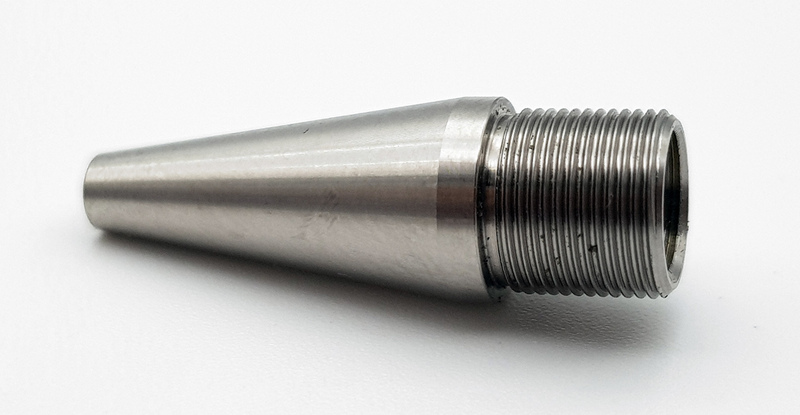 The Nitecore NTP40 Titanium Alloy Mechanical Pencil is a pencil made of Titanium alloy TC4 machined with a CNC machine (computer numerical control), characterized by an excellent lightness, excellent resistance to shock and corrosion. The Nitecore NTP40 is an excellent travel companion for all situations in which a prestige mechanical pencil is needed to write or draw fluently. The Nitecore NTP40 is compact and light and equipped with a good grip to easily write in everyday use without getting tired. The Nitecore NTP40 package remembers the one previously seen with the NTP30 tactical pen. We have a semi-rigid black cardboard box. On the front the writing Nitecore, the name of the model NTP40 and the type of mechanical pencil TITANIUM ALLOY MECHANICAL PENCIL 0.5mm Lead. In the central part there is also the stylized design of the new NTP40. Inside the package we find the Nitecore NTP40 inserted inside a shaped protective foam with a yellow cardboard on it with the writings that identify the main parts that distinguish the Nitecore NTP40. Nitecore's NTP40 mechanical pencil is made of TC4 titanium alloy and CNC machined. With this type of processing a light product is obtained but at the same time very resistant to impact and corrosion. In addition to being light, the NTP40 holds well in the hand and does not slip thanks to the special 26-thread slip-resistant processing. This treatment facilitates writing comfort even for prolonged use. The internal cartridge containing the mines is of German construction. It is a 0.5mm Schmidt Feinminen system. This system allows a smooth and legible writing in every situation. The Nitecore NTP40 can also be completely disassembled. The processing of the NTP40 threaded parts is always of quality. The thread are precise and smooth. Particularly at the head of the NTP40 is the mine thrust cap with the cap with crystallized finish for excellent abrasion resistance. Every pressure we make on the head pushes the mine out perfectly and evenly. The Clip that we find installed on the NTP40 is also made of titanium alloy and allows an excellent portability of the NTP40. It can be removed by unscrewing the two fixing screws. 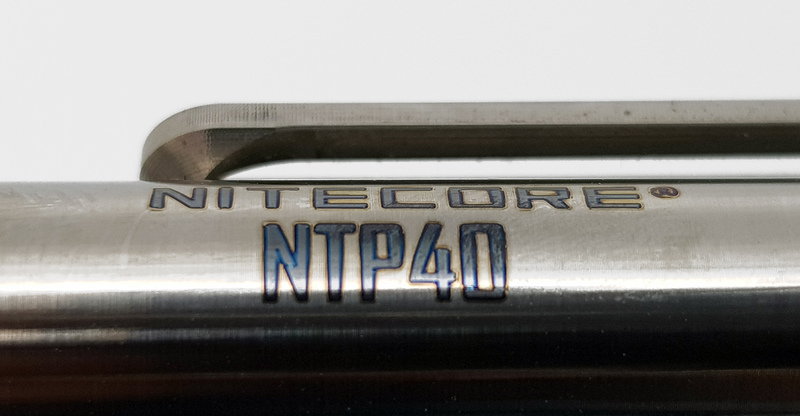 The writing NITECORE NTP40 is excellent and we find it engraved on the central body of the pencil. The Nitecore NTP40 next to the Tactical Pen NTP30. 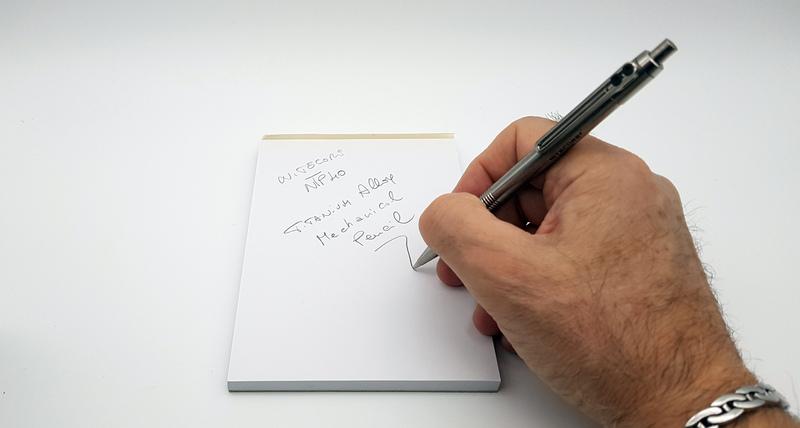 CONCLUSIONS: The Nitecore NTP40 TITANIUM ALLOY MECHANICAL PENCIL is a mechanical pencil made of titanium, valuable material resistant to impact and corrosion. The processing is accurate, precise and without imperfections. It wears well and can be a useful everyday companion "EDC", also thanks to the excellent Clip, it can be easily stored in trousers, jacket, case, backpack etc. The NTP40 is equipped with the German-made 0.5mm Schmidt Feinminen mine port system. Thanks to this system and the excellent mechanical precision, the writing quality is always high. In conclusion, the Nitecore NTP40 is an excellent product, elegant in its forms, precise and light in writing. The selling price is not low but if you need a quality and prestige pencil the Nitecore NTP40 is the right product.